Rear always means back of vehicle, for instance, the rear of the engine is the part closest to the rear bumper. Right means passenger side, left means driver’s side, and front means front of car, no matter where you’re standing. and need little attention. Anyone can build an engine but the stuff that attaches to the engine needs to be attached right too. The engine isn’t a powerplant without this stuff attached right. As a powerplant, the engine is able to pump fuel to itself, make electricity for itself, and keep itself cool. When all these things are right, then it’s viable and not in a self-destructive mode of operation. Anyway, it’s entirely possible to make any VW reliable for the long haul and that starts with the engine/powerplant. Building a VW engine that lasts means building a VW engine that runs cool, or let’s say in the temperature range it was designed to run at. One of the myths out there is that VW engines run hot. Well, you may burn you finger if you touch a warmed up engine but they don’t run any hotter than the engineers who designed them to run – unless there’s something wrong. VW engines have proven themselves all over the world in every climate. They gained a reputation long ago as being reliable and trouble free. Allied troops often abandoned their water cooled vehicles in the Sahara desert area of northern Africa during World War 2 in exchange for Kubelwagens abandoned by the German Army. How could a vehicle so well-known and respected overheat and somehow need external oil coolers, fans, thermostats, special oil pumps, breather boxes, and sometimes multiple tens of feet of extra hose to route the oil to an add-on cooler? There are two heat sources in a VW – combustion and friction. Combustion in the cylinder and friction from all the moving parts. Imagine the engine is being rotated by some electric motor – there’s no combustion. The friction from the valves going up and down, the pistons sliding up and down in the cylinders, the crank, rods and cam rotating and rubbing against their respective bearings and the lifters sliding over the cam under pressure from the valve springs. Not a lot of heat would be created. That would change without any oil but the oil prevents galling and actual metal to metal contact so. Without oil, all these parts would gall as they rubbed – they’g get real, real hot and lead surfaced bearings would literally melt. Galling? The same thing that happens to your the skin on your elbow when you fall off a bicycle and meet the pavement. But the thing is, if you rotate oil filled, non-running VW engine with an electric motor it probably won’t get much hotter than the temperature of the surrounding environment without the fan even turning. So it’s pretty obvious that the heat comes from the combustion in the combustion chamber. Since the oiling system pumps oil through the entire engine, as the oil reaches the head via the pushrods (that’s what the hole in the middle of the pushrod if for), the oil gets hot from contact from the hot head in a running engine. After it contacts this area, it flows down into the bottom of the case, is picked up by the oil pump, routed through the oil cooler, to the bearings, lifters and back up to the head via the pushrods. So the heat source is the headThink of this – if you add an extra quart of oil to a VW engine it will actually run hotter when driving at slow speeds, stopping and starting in town driving for instance. This is because the higher oil level in the sump slows the drainage of oil from the heads back into to the sump – the bottom of the engine case. It slows down the whole process. At highway speeds, a quart too much makes no real difference since the fast spinning crankshaft is throwing the oil all over the place and it never has a chance to settle in the bottom of the case. Some believe the engine runs hotter at idle. Not so. At idle, with fewer explosions per minute and no load on the engine, things tend to cool down quite a bit. One attempt at … something … is a product that consists of a bottle filled with a mysterious “top cylinder lubricating oil” with a tube leading from it to the intake manifold and this oil ends up in the combustion chamber and it’s supposed to make the valves/seats last longer and thus seal longer and lubricate the piston rings “from the hot side”. The manufacturer makes a lot of claims but I see no evidence of any problems without this product in a properly built engine. What really happens is this: this oil gets burned during combustion before it can even do anything and the carbon created by this deposits itself on the valve seats preventing the valve from seating properly. Now, during combustion, since the valve doesn’t close all the way, hot, burning combustion gases pass by the valve and the seat and the valve begins to burn. Nice, huh? This oil also creates carbon deposits on the top of the piston and on the surface of the cylinder head and over time, it’s possible this will increase the compression and thus makes the engine run hotter. And even though this oil passes by the intake seat on the way in and supposedly helps the seat last longer, it’s more likely some will get deposited on the seat on the way in anyway, causing the above. If one has a plate of steel – say a foot square and a tenth of an inch thick for instance and aims a torch at it near the middle, it takes some time to get it red hot. If one aims the torch at the edge, the corner gets read hot instantly because there’s still the same amount of heat from the torch but at the edge there’s less metal for it to be absorbed by so this smaller amount of material is absorbing all the heat. At a leaky valve seat, the same thing happens. The edge of valve and the narrow edge of the valve seat gets so hot – even beyond red hot – tiny particles of valve and seat disintegrate from the heat and they are literally removed and little by little – particle by particle. As the valve/seat erodes, the sealing gets even worse, the surfaces get hotter and hotter (bigger leak means more hot gasses passing by), the particles get bigger and bigger until you have a burned valve that may actually be missing a pie slice from itself. Engine will barely run like this – burned valve, real low compression. So stay away from the Marvel Mystery Oil feeding devices. It will only DAMAGE your engine, not help it in any way, shape, or form. The bottom line is, if you have a gauge that tells you your oil temp is too high, adding a cooler may cool the oil down to where you expect it to be but the head is still running hot. You aren’t fixing the problem, you’re masking it. As the engine is running, a typical oil temp sensor is reading the temp of oil that’s already cooled the engine -oil that’s run down from the head and oil that’s squirted out of the bearings lands in the sump. The oil from the heads is significantly hotter than oil that’s come out of the crank bearings. They mix and the temp of the oil reflects these two temps combined. The so-called magic number for oil temp is 180 degrees fahrenheit. The typical head runs about 250 degrees. How can anyone expect the oil in the sump to be at 180 when the head is constantly running at 250 and heating the oil? Also realize, that the oil does not cool the head – that’s what the cooling fan is for. All it does is lubricate the valves within the guides, the tips of the pushrods, and the rocker arms themselves. The oil that’s lubricating the bearings has just come out of the cooler. The oil just out of the cooler that leads to the heads has to travel through the lifters and up the pushrod tubes to get to the head. So if your oil temp is 220, 230, 240, big deal. It’s measured in the sump and by the time it gets to the bearings in the crank, it’s cool again! It’s amazing that it’s any cooler than the head in the first place before it goes through the cooler. So no gauges. All they do is mess up the dash anyway. So what makes the engine run hot? Nothing! The only reason a VW engine “overheats” is when something is amiss. To start, air leaks in the intake manifold – a leaky hose, bad boot between center section of manifold and end casting on a dual port engine. Leaky gaskets between manifold ends and head (very common with aftermarket manifolds that come with dual carb kits – do not use the stock steel gaskets, they will probably leak – use the thick aftermarket paper gaskets. Steel Kadron manifolds often require 2 of these gaskets EACH SIDE for proper sealing. When someone uses oxy/acetylene to weld, one turns on the acetylene an lights the torch. The result is a weak, sooty flame relying only on the oxygen content of the air to burn and it’s not hot enough to melt any metal other than solder for instance. When the oxygen valve is is turned on, the flame gets very hot and looks like a jet, it even sounds like a jet. It is now hot enough to melt metal. The oxygen/fuel ratio is increased so the flame gets much hotter. The fuel system of an automobile operates with an ideal air/fuel ratio. The burning of the fuel is totally dependent upon the oxygen in the air. Perfect ratio at idle is about 13:1. When you have an intake air leak, the volume of air goes up and just like the torch, the combustion temperature goes up. And cooks the engine over time. Realize what a intake leak is – it’s air that enters the combustion chamber that does not go through the carburetor (or air flow sensor of fuel injected vehicles). 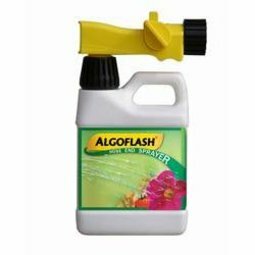 You may have seen an item used by home gardeners that consists of glass or plastic bottle with a tube reaching to very close to the bottom of the connected to a nozzle pointing on one direction and a place to attach a garden hose from the other direction. With liquid in the bottle and the hose turned on, the movement of the water through the yellow part in the pic and past the top opening of the nozzle in the bottle pulls the substance out of the bottle and the plants get sprayed with the substance mixed with the water. A carb works the same way but instead of water being pushed through the hose, it’s air that being sucked through it from the left by the engine. If there’s a leak in the manifold (or a pipe or hose on the left side of the bottle), there’s less air to pull fuel out of the carb and the engine runs lean – too much air vs fuel and it thus hotter, just like the torch. About “suction”. Actually, there’s really no such thing as suction. Imagine you’re on the bottom of the sea holding an empty mayonnaise jar. You take off the lid. It instantly fills with water. Actually, water just falls in. Air behaves the same way. It just falls into the engine when the piston goes down with the intake valve open. And just like with water, any leak in the intake system (this is between the carb and the engine) will allow extra air to fall into the engine. But it’s not really extra air. It’s just that air will fall into the engine any way it can – through the carb, through leaks in the manifold between the carb and the engine, between a loose spark plug and the head, through cracks in the head, and between the cylinder and the cylinder head. You must have ZERO AIR LEAKS ON ANY ENGINE. This is really easy to to do when you’re doing a rebuild and it’s too late to do it after it hurts the rebuild. Build your engine bulletproof to air leaks and it’ll last as long as possible. Don’t, and it won’t be long before you have a burned valve or on the way there, one cylinder with a bit lower compression than the others (15-20 lbs lower than the other 3). If you build it right they’ll stay pretty close to even for a real long time. So all this “suction” is created by the piston travelling downward allowing the air to fall in – trying to fill that void – with the intake valve open. If there is an imperfect seal between the top of the cylinder and cylinder head, you have an intake air leak too – same effect as a leak in the intake manifold. It flows in just like water would if the engine was submerged. VW knew this in the fifties with the old engines with “stale air” heating systems. In these engines, the heat is the air that the fan has blown right over the potentially greasy engine and thus it’s heated and used for heat in the vehicle and can make for a nice stink whenever it’s on. There were copper rings around the cylinders like a collar but not between the sealing surfaces of the cylinder head and cylinder. The sealing ring was there to prevent any potential leakage between the cylinder and the cylinder head sealing surface (deadly carbon from getting into the passenger compartment). Realize, stinky heat from an oily engine is not the same thing as the poisonous carbon monoxide gas that leaks past the cylinder/cylinder head mating surface. Grease stink probably won’t kill you but you’ll feel like taking showers more often on than normal on a long, cold trip with the heater on. This one is from a type 1 engine. It was a low mileage rebuild. These were new heads and now all the valve seats are beyond saving. The case has 8 millimeter head studs. When the engine was running, you could hear this leakage as a low pitched roar when it was revved. 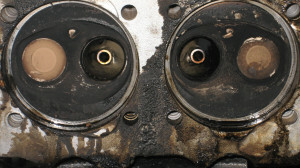 The carbon deposits on the head but outside the combustion chamber are from combustion by-products leaking past the gaskets. But this is not the only leak – fresh air also gets pulled in during the intake stroke and exactly like an air leak at the intake manifold, this leak causes an engine killing lean mixture. You need a perfect seal here. Without a perfect seal, you get four leaks at one place – intake leak, compression leak, combustion leak and an exhaust leak. Result? 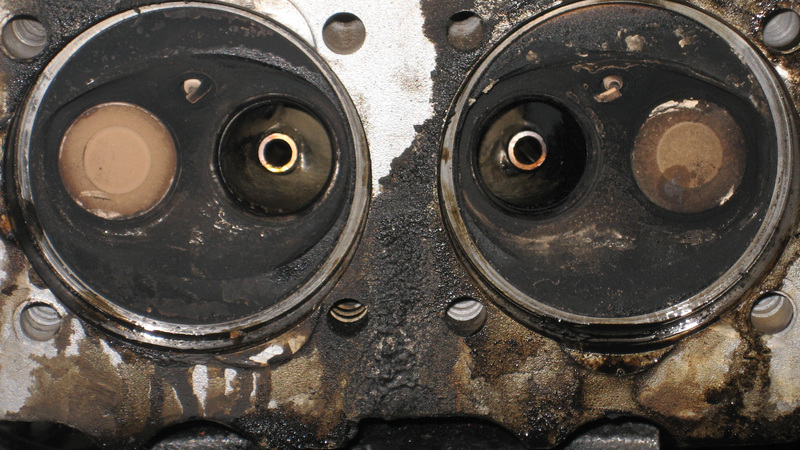 A real mess and destroyed, unserviceable valve seats due to severe overheating caused by extremely high combustion temperatures due to the air leak here, a hot cylinder head as a result, and thus, higher oil temperatures. Leakage at the cylinder/cylinder head interface typically cannot be detected with a compression gauge or a leak down test unless the leakage is massive, like a broken gasket would cause. It’s easily detectable though – all you have to do is look at the interface from below the engine. If you see what looks like combustion by-products (looks like oil) dripping from here onto the center of the pushrod tubes or off of the air deflectors or just all over the surface of the head like in the above pictures, you’ve got the leak. On type 4 engines, this substance can literally fill the concave cavities on the air deflector and the cooling fan blows it all over the place. It can make for a lotta smoke as it falls on the exhaust of catalytic converted equipped vehicles. Too far advanced timing also makes the VW engine run hot and from higher combustion temperatures and it’s mechanical effect on internal parts. When one pedals a bicycle, one “times” the pedal strokes according to the speed of the pedaling. When one hit’s a baseball with a bat, one must hit the baseball just right or – have you ever hit a baseball wrong – remember how the bones in your arms felt? All timing is is when the spark plug fires – then the explosion happens – it’s when the spark plug sparks relative to the position of the piston. What’s supposed to happen it the fuel is ignited as the piston is still travelling upward but just before it starts going back down again. This way, the piston is already going down when the fuel really starts burning, and the piston has plenty of downward momentum. Just like pushing downward on a bicycle pedal at 2 o’clock position is easier than pushing downward at 12:30 position. With timing too advanced, the fuel mixture is lit too early, the piston is still relatively far from top dead center, and the explosion is violent when it’s just barely starting to go down and resistant to downward movement (momentum lacking and crankshaft position at near 12 o’clock position so the shock wave of the explosion slams into the piston and makes noise (pinging) – it makes exactly the same sound as if you’d hit it with a hammer. Try pushing a bicycle pedal down at 12:00 position. All this resistance creates heat and … hotter oil. Too far advanced timing can even mimic a weak battery when starting – ignition of the fuel literally tries to push the engine backwards. Many batteries have been purchased when the only problem was the timing was off. Think of this: you’re standing on a platform that reaches 30 feet into the air. You have a baseball bat. Someone pitches the ball straight up and you hit it just like on the field as it’s coming towards you and it heads back down real fast. But if you hit the ball right as it starts to go down, you do speed it up some but it’s a gentle on the baseball. Same for the piston – we “hit it’ (explosion becoming more violent) on it’s way down, but prepare for the hit (initiate combustion) on the it’s way up (advanced timing). Many cars have retarded timing. This means spark is initiated right when the piston starts going down. This was done to reduce hydrocarbon emissions. Advancing timing increases hydrocarbon emissions. Anyway, when your timing is too advanced, you may hear pinging. This sound is cased by the explosion hitting the piston before it’s really starting to go down – the crank throw for that piston is still near TDC position – it’s like trying to force a bicycle pedal down from the 12 o’clock position. So it’s as if the piston is stationary – not really moving – and when the ‘shock from the explosion hits it, it might as well be a hammer and if you hit a piston with a hammer, it’ll sound exactly the same. And over advanced timing does exactly the same thing to the piston as hitting it with a hammer. If you drop a rubber ball from any height, when it hits the ground and stops, it does bounce, but not as high as you dropped it from. This is because the some of the energy the ball had when dropped is used by the deformation of the rubber (flattens a bit), the ground (no matter what it is, even concrete) deflects a bit, and there’s a tiny increase of heat in both the ball and the ground. In an engine, the same thing happens to the piston due to the explosion. If the piston is a few degrees past TDC and headed down, the explosion makes it move downward relatively easily and if it’s closer to the TDC (12:00 o’clock position on bicycle) the piston resists movement and the piston gets hotter than it should. So check your timing carefully and never try to advance timing beyond correct by the specs to try and a poor idle or hesitation. If the timing is right, it’s right. High compression also makes for a hot engine. This is because the explosion is confined to smaller place. Put a firecracker in a mailbox, it won’t do more than blow the door open. Put the same firecracker in a tiny box, it’ll definitely do more damage. High compression makes for higher head temps, thus hotter oil. It can also make an engine ping since the explosion is so violent it’s like hitting the piston with a hammer, literally, just not a with a hammer head but with a shock wave. It can make the head surface so hot that when you turn off the engine and thus have no spark, the engine diesels because even though the key is off, it still turns a few times before it totally stops but since it’s turning, it’s still pulling in fuel and with a hot head, this heat ignites the fuel. The other thing that makes a VW engine run hot is when air that has already cooled the engine and is thus heated compared to the ambient temp and somehow gets into the fan. The VW cooling system is very simple. Air comes through the vents in the body, through the fan, over the engine and out the bottom and exits past the bumper. If you lift the hood on any air cooled vehicle besides the type 3, and you can see the ground anywhere near the rear of the engine, it’s over heating because the hot air that’s supposed to leave past the bumper gets into the engine compartment and back into the fan. So if you can see the ground, you’re definitely running hotter than possible. Since type 3 vehicles have a duct leading to the fan, non of this applies. Just make sure the rubber boot is intact and correctly installed, it should be fine. But for everything else, you should not see the ground. For type 4 buses, VW even used caulking to seal the sheet metal to the aluminum fan housing under the fan and where the sheet metal parts mate with each other at the back (remember, back is towards the back of the bus). Long ago I built an engine for a 67 bug. When it was done, the oil light was on at idle and didn’t go out until about 1500 rpm. When it was turned off, it ran and ran (dieseled) until I put it in gear and let out the clutch. I could find nothing wrong and being young, uninformed and perhaps stupid, I took the whole thing apart, changed the case and the oil pump and put it back together. Same thing, still ran hot. There was a small gap between the engine surround seal and the right side of the engine just to the rear of the passenger side fresh air hose. I bought some stuff in an aerosol can that comes out looking like vomit and dries like styrofoam. I sealed the interface between the engine and the body with it. The problem went away. So, if you see the ground, it’s guaranteed to be running hotter than it could. Every car is different. Apparently, the ground view on the ’67 bug was in just the right place. It takes about an half hour of highway driving to warm a VW engine up to “normal” operating temperature – about 180 – 220 fahrenheit in my climate on the coast of central California with average daytime temps in the 50-70 range. It’s usually in the cooler end of the range where I am. At 55 mph, it’s tends to be lower, as speed increases it gets hotter and increases going up hills and decreases going down hills and remains pretty stable when it’s flat. Imagine the moon was low on the horizon and you could drive to the moon (a real, real long grade with no flat spots -uphill all the way) – would the oil temp reach infinity? That I don’t know. We don’t have any hills that long on planet earth so the VW engineers didn’t have to worry about that. But the bottom line is that a properly built VW engine does not run hot, they just run at the temps they’re designed to run at. Would VW make a car and sell it to millions of people if it overheated? Would anyone buy a vehicle that had an inherent overheating problem? I don’t think so. And remember, all those oil temp sending units are measuring oil that’s just come off the head for the most part. Imagine it’s 1984. You’ve just had your 1976 bus engine rebuilt. Your mechanic mounted an oil temp gauge on your once pristine dash. He tells you to pull over and let it cool when the temp reaches 220 F. You pull over into a rest stop half-way up the Grapevine – one of the longest hills on Highway 5 in California. While your waiting, 20 VW buses without gauges drive right up the hill, no worries, no gauges. They all last a long time. Do you think VW’s engineers would side with your mechanic or tell to drive on with the rest of them? Some of those bus engines lasted over 150,000 miles – no extra coolers, no extra hoses (and each added hose is an extra place to leak) no gauges, nice, uncluttered dashes. No gauges, no extra coolers needed. And coolers make it take a real long time to warm up the oil and long warm up times make for increased wear and accelerated piston ring wear resulting in increased oil consumption. Warm oil works better than hot oil because it’s thinner hot and that makes it easier for it to flow between parts.